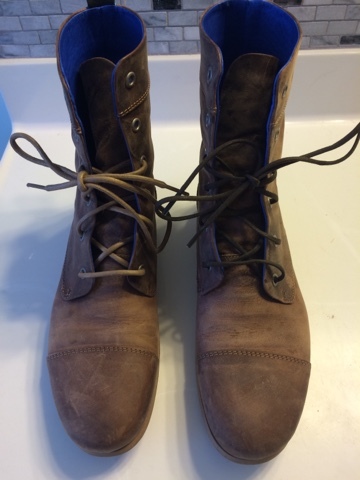 Dinie's Tangled Threads: New boots. Its almost spring here in Minnesota!! That means its time for me to get my spring capsule wardrobe out. So, I had been looking for another pair of boots. I decided if I bought grey I would be the grey woman. Too much! 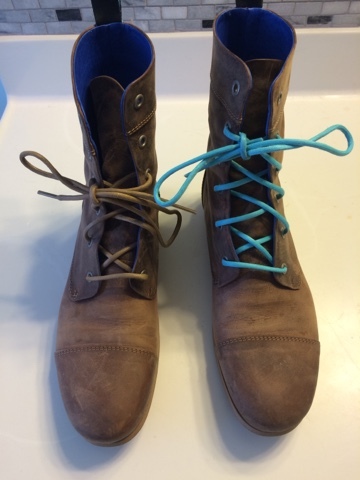 I got 3 different colors of laces when I bought them. The aqua/mint matches my purse. Its in my spring capsule as well. Im not sure how often I am going to remember to switch the laces though. I wore them with the mint laces first and I just changed them to the light brown ones for the rest of spring. Well what do you think of my addittions to my capsule? Do you do a capsule? Leave a comment to your blog if you do, Id love to see it! *Update*-I bought these in March 2016. When I polished them they got a little bit darker, but I still really love them. I have put them away fro the season because I'm barefoot most of the time in the summer.